Sherry grew up in rural Georgia, where she spent much of her time with her grandmother, Estelle Lawson. Her grandmother had wonderful vegetable gardens and orchards. By the age of five, Sherry was in the garden by 6am every morning. She spent her days planting, picking, canning, and cooking, and fondly remembers standing on a big, heavy chair at Grandma's stove, stirring a pot of wild blackberry jam. Sherry's experiences with growing up on the farm taught her to appreciate fresh, local, seasonal foods. Sherry eventually moved away and had a successful high-tech career with companies such as IBM, Novell and Macromedia. During the last 12 years of her career in technology, Sherry was SVP of Operations & Customer Care for Macromedia where she was responsible for about 300 employees worldwide. In 2005, Sherry retired from technology to start Culinary Getaways. Culinary Getaways focuses on introducing guests to the riches of the Northern California Wine Country, Paris, Provence, the French Riviera, Savannah and Tuscany through unique, carefully-crafted, food and wine experiences. An avid chef, Sherry has taken cooking classes all over the world, including Raymond Blanc's Le Manoir aux Quat Saisons near Oxford , Le Cordon Bleu in London, and culinary weeks with Patricia Wells in both Paris and Provence. Sherry has also taken classes in Japan, Italy, and locally in California. In additional, she has completed a number of professional wine classes at the Culinary Institute of America in St. Helena. She is passionate about cooking and entertaining and is thrilled about her second career in food and wine! Sherry is married to Bob Page and they live in Sausalito, California. 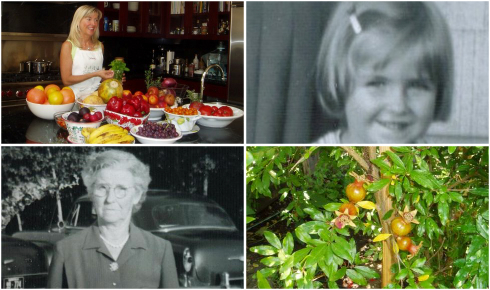 My love of food is a family legacy: from my grandmothers, mother, and aunts, all terrific cooks; from my father and uncle, both serious gardeners. I had a special bond with my grandmother, Estelle Lawson. At the age of five, I moved in to "look after" her. She taught me to cook and to appreciate fine, fresh food. Our gardens grew peas, beans, corn, okra-to name a few! We had pigs, cows, and poultry. Each season brought new, delicious tastes. Down our dirt road was a wild berry patch where we'd pick buckets of blackberries for jam and cobblers. In my earliest memory, I'm standing on a chair at the stove, stirring a pot of jam, the flavors intense and perfect! Among our fruit trees, we had a pomegranate. A scraggly little bush, in Fall it bore amazing fruits-red balls with elegant jewels inside! My sister and I checked the fruit for weeks. When it ripened, we ceremoniously ate the seeds one by one. Grandma used the earthy juice in fruit salads. The seeds made meat and vegetable dishes seem exquisite. My grandmother died when I was 18 years old, but I feel she's with me still. In her memory I've planted a pomegranate - its ancient myth the perfect symbol for her love of great, seasonal food. Why did I choose the pomegranate as my logo? Glad you asked! In mythology, the pomegranate represents the seasons. Since my philosophy is all about cooking with what is fresh each season, it was the perfect symbol for Culinary Getaways. Please read below for a summary on the ancient story of the pomegranate. I hope you enjoy it! The pomegranate, a symbol of fertility, is the fruit that caused the cycle of the seasons, as told in the ancient myth of Demeter and Persephone. Demeter, the Greek goddess of fertility, makes the earth fruitful. She taught mankind to plow and sow, so they could end their nomadic existence. Demeter was the mother of Persephone, who was abducted by Hades, lord of the underworld. Distraught, Demeter wandered the earth searching for her lost child. While she searched, the earth became barren. Finally, Zeus took pity on mankind and ordered Hades to return Persephone to her mother. However, before she left the underworld, Hades gave Persephone a pomegranate and she ate three of its seeds. This bound her to leave her mother for three months of the year and return to her husband in the underworld. When Persephone leaves her mother to return to Hades, Demeter mourns, the earth is barren, and we have three months of winter. When Persephone returns, Demeter rejoices during the fruitful months of spring and summer. In autumn, Demeter again begins to mourn Persephone's departure for the underworld, and the earth begins to enter its winter sleep.